Want to dive head first into cake smash photography? Here are our tips and tricks for achieving those sweet and savory images! Have you heard of the term “Cake Smash”? This type of 1st (or even 30th!) birthday photo shoot has become a fun way to capture all of the excitement of birthday milestones! It looks (and tastes–yum!) 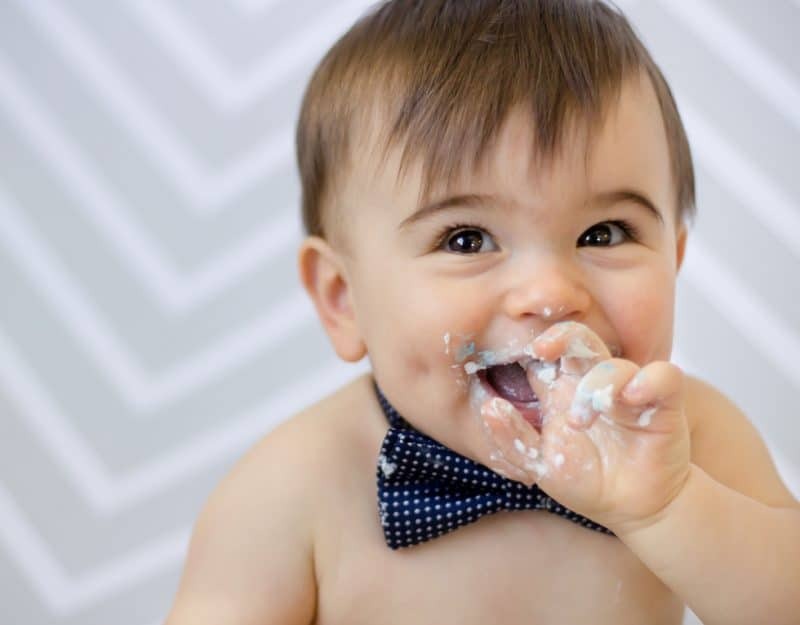 just like it sounds; Baby + Cake = Many great photo ops! But, if unprepared, the whole thing could end up with cake on your camera and a stressed-out client. Read on to learn our 15 secrets to deliciously perfect cake smash photos. 1. Get some basic shots first! Grab some regular portrait shots of the baby (I bring my round flokati and a toddler chair/crate to put down on the seamless paper for baby to sit on) before you introduce the cake! This is great for those shots where the baby is clean and eager to dig in! Have parent place the baby down behind the cake while you’re already in place with the camera, so you don’t miss the first moment of cuteness! You can also get a few shots with the parents smiling off to the side (because we all know how much parents love watching their little ones have fun)! It may make for a cute family photo to add to your gallery! Make sure the cake is made with frosting, not fondant. It’s yucky and a choking hazard! You can also try other adorable “smashes”– I loved this super sweet donut smash and I’ve even seen photographers do Taco and Pizza smashes–that’s my kind of birthday! Have the cake on an adorable cake stand if possible! You can also ask the parents if they have any cute accessories they’d like to include (but make sure to mention only 1-2 things, and not an entire bag of hats/toys)! You’ll also want to make sure you discuss all color options before the session! 5. Extra treats for all! If you’re providing the cake, bring along a few cupcakes from the same bakery parents can enjoy–watching all that yummy cake smashing makes you crave it I swear! Plus, winning a few extra points with mom and dad never hurts! Have parents help clap, sing and dance behind you. Babies like their parent since they’re familiar with them! If baby is a walker, he may get up and run off the set. Remind the parent how helpful it is if they can relocate baby to the set that way you can stay stationed with the camera ready to capture the cuteness and make sure to THANK THEM! The great thing about cake smashes is they can be as simple or complex regarding the “set up” as you and the parent’s desire! Try a simple roll of seamless paper indoors, blank or with minimal decor (a few balloons and a banner looks awesome! ), a more complex set with custom themed props, or a simple outdoor set up with nothing but baby and cake! Make sure to get pullback shots, up close, details of babies toes with frosting and fingers with frosting, etc. Adding extra detail images to your gallery can also help if you want to upsell some images to your clients! You’ll want to set your camera to a higher shutter speed just in case the little stinker does something quick and adorable. I like 1/250+, but if I have enough light, I’ll even go a bit higher. 10. What if baby doesn’t want to smash the cake?! Many babies actually don’t want the cake and either barely poke it or try some and don’t want to eat the rest. I give baby about 5 minutes to explore the cake on their own, then if they’re not digging in, have the parent grab a chunk and hand it to babe (then step away) and see if that helps baby get what to do. If you approach the end of the session and baby hasn’t smashed the cake, ask mom if she’d like to mess it up a bit, for the photo Many parents want this big mess and the baby just doesn’t do anything to create it! When done, encourage parents to go ahead and stick baby in a tub, etc. whatever they’d like to do to clean him up while you clean up the set. Bring along something adorable like a little baby toy, board book or photo frame, a birthday card that you can write a thank you in and some referral cards. 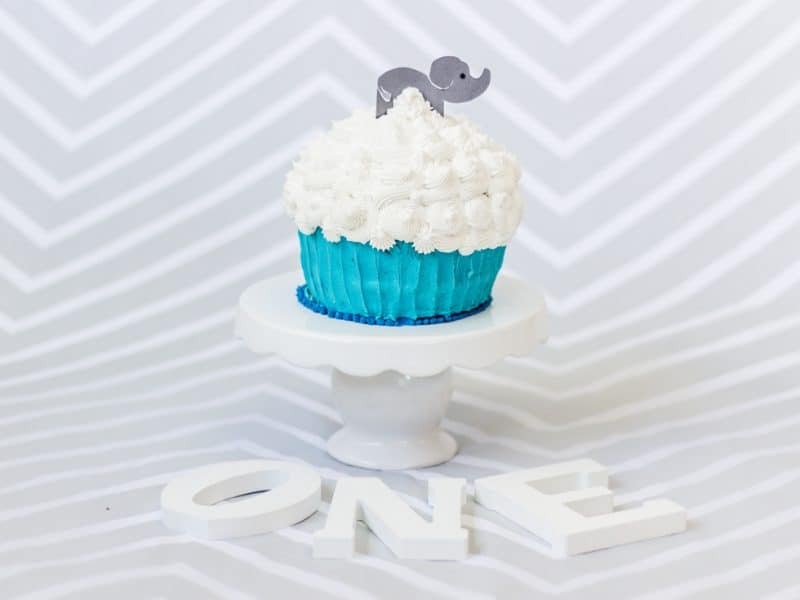 Wrap adorably in your brand colors and give to parents at the session to celebrate the little tyke’s birthday! For more ideas on client appreciation gifts, check out this great tutorial on how to impress! Send along some free prints in the mail to surprise and thank your client! Wallets are sweet for cake smashes since they may not be the kind of photo your clients hang in the living room but they’ll want to gift to family and friends (possibly even in the birthday party thank you’s)! 14. Gift a video slideshow. Create a video slideshow or even better a video incorporating photos and video clips to showcase all the fun to upbeat music! This is great for them to share on Facebook which could bring you even more cake smash clients! Find a local baker to partner up with! You can offer your clients custom gourmet cakes (I have it as an add-on! ), the convenience of you bringing it with you to the session and the baker can advertise your services–Win, Win, WIN! Networking can really get the ball rolling! Remember this type of session is hyped for the fun of it all, so your client may have very high expectations for the experience! With these tips in mind, you can ensure that you manage all the moving parts while the parents enjoy this special milestone with their little one. Bring on the cake! Kate Guertin is a portrait photographer and owner of Sweetest Things Photography, specializing in newborns, children and families and based out of Central, Massachusetts. Former corporate marketing rep and mom-tographer turned pro, she is a young wife and mother of a beautiful little girl, Charlotte and a serial Netflix watcher. You can usually find her cleaning up yogurt spills, editing in sweatpants and adventuring in the aisles of Target looking for new photography props!